Natural casings are taken from beef, pork, and lamb. Each type of casing is used for different sausages. All natural casings can be resalted even if they have been soaked. Just take regular table salt, wet it and apply generously on the unused casing. Pack casing in a air tight container and refrigerate. DO NOT FREEZE! Freezing a natural casing will weaken it and it will be no good after it has thawed. Properly stored natural casings can last under refrigeration for at least one to two years. 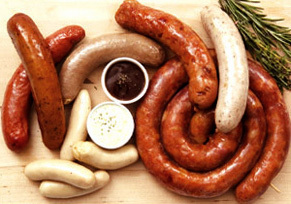 If you want to make smoked sausage have a better color and flavor, make up a solution of 25% liquid smoke and 75% water. Take sausage that has been already stuffed and is ready for smoking and dip into this solution for a few minutes. Remove and allow to dry for 5 minutes and then place into your smoker.